Without question, the biggest surprise on television of any type in 2017 was Netflix’s semi-obscure mockumentary series, American Vandal. I remember sitting down to screen it last summer, expecting something humorous but not particularly innovative. And then I remember midway through the series realizing just how invested I was in the story. Finally, I remember nearly tearing up during the finale, because of how emotional it wrapped up its story, revealing the perpetrator of the crime, but in the process explaining so much of the difficulty of growing up in modern society. I had no idea when I began watching the show that it would affect me as much as it did. It was a masterpiece of storytelling, enveloped around an absurd set of circumstances and a motley crew of characters that enabled the show to masquerade as one thing, while actually being something entirely different. It was so good, in fact, that I wondered if it could be duplicated. American Vandal, created by Tony Yacenda and Dan Perrault, builds off the true crime “entertainment” frenzy of the past several years. We’ve seen This American Life and the success of Serial and S-Town, we’ve watched the rise of Up and Vanished, My Favorite Murder, and so many other podcasts. On Netflix, we all know the case of Steven Avery chronicled in the biased, but compelling Making a Murderer. More of these style of shows are being created as I compose this review, because there is so much interest. This collective audience holds an insatiable appetite for a good mystery. Season 1 tackled an act of vandalism at a public school. It was phenomenal. I have urged everyone to watch it, gave it an A+ review, and it made my 2017 Top Ten. It would have made a Top Five, had I specified even further. Season 2 had much to live up to, because the depth of the plot and the way in which a simple crime committed by a teenager could end up speaking to the challenges of being a human being with feelings and idiosyncrasies was so well-executed. I can’t be prisoner of the moment as to whether 2018 surpasses 2017, and I am planning to rewatch Season 1 when time allows, but what I can tell you is Tony and Dan have done it again. Season 2 of American Vandal is as special, or maybe even MORE so, than 2017’s entry. It returns with an even more layered narrative and a new group of teenagers and adults to meet, all of whom share the same insecurities. The crime is more ridiculous than the first, whereas Season 1 was drawing male genitalia on faculty cars, this time around it is a mysterious online entity who calls himself or herself the “Turd Burglar.” The crime itself is a “poop prank” known as “The Brown-Out.” The setting is the most subversive of possible locations. In fact, the entire season contains its share of a flipped hierarchy, as the location is St. Bernardine Catholic School in Bellevue, Washington. The season opens just as its predecessor did, learning about the crime and also naming the prime suspect. In similar fashion to Season 1, that individual seems guilty, but we realize there’s far more to come, and there is evidence to suggest things are not what they seem. Back as the investigators/documentary filmmakers/sleuths are Peter Maldonado (Tyler Alvarez) and Sam Ecklund (Griffin Gluck), and they’re just as good this time around as they were last year. The format and structure of the show is nearly identical to Season 1, and you wouldn’t want it any other way. 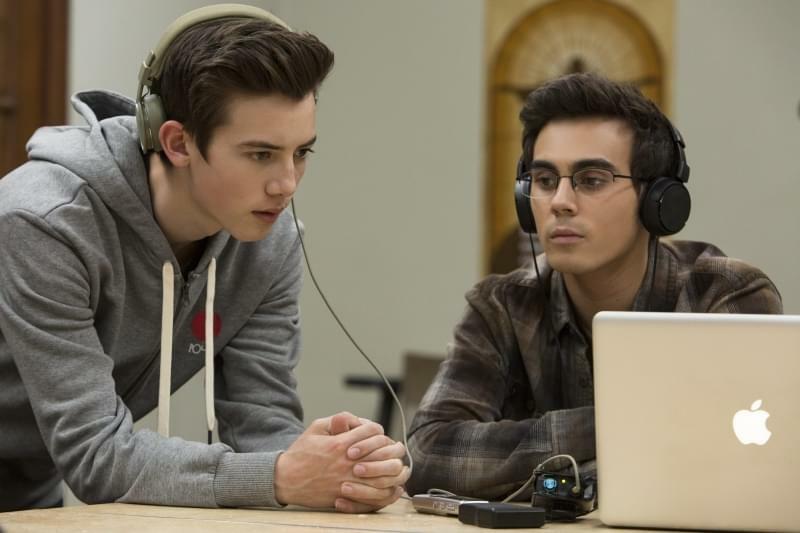 Unlike Serial, which made a mistake in going from a case many of us didn’t know to one we all did that was far less interesting and contained much less of what made the initial season work, American Vandal does the same thing it did last time. It maps out the case, gives us the characters, lets us hear from them, presents alternate theories and suspects, shatters and creates alibis, creates intrigue and drama, adds stakes to the mix, and in the end makes us care deeply about its people. What’s unique this time around is the scope. We learned a lot about Dylan Maxwell (Jimmy Tatro) in 2017, and his story resonated so well because of how it was paced and meticulously laid out over the course of eight episodes. But at St. Bernardine, there are new considerations and new angles to exploit, including emphasis on athletics and how certain students can find themselves above the law if, as one character says, they can “throw a ball through a hoop.” There’s the money side, where the basketball team and its history of churning out college and pro athletes helps fund the entire school, leaving it nearly untouchable. 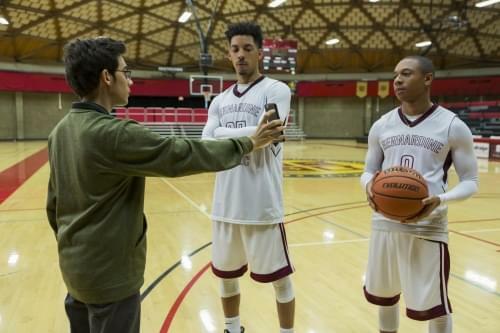 One of the best lines in the series comes relatively early, as one key contributor to the season says, “I attend a basketball business with an academic facade.” It’s not there to bury sports at all, but to show how priorities can be out of order. But, just as in Season 1 with Dylan Maxwell, the Johnny Knoxville style prankster that ultimately found himself lonely and unhappy, we see as Season 2 moves along a common, sobering theme tying everyone together. The conclusion to the season, once the Turd Burglar is finally revealed, is more effective than the reveal of 2017. The final five minutes of the eighth and final episode is spectacular television, to the extent that out loud as it finished, I said from my chair, “What a beautiful ending.” Season 1 had a powerful finish. Season 2 trumps it. Jimmy Tatro was exceptional in the first installment, and Season 2 brings its own stellar acting. Melvin Gregg, who plays DeMarcus Tillman, maybe the number one ranked high school basketball player in the nation, is FANTASTIC. He’s hilarious at times and devastatingly real at others. He’s this year’s Tatro, although you could also put Kevin McClain (Travis Tope) in that same category. Both actors are tremendous and the writing is top-notch, weaving its details and ending each episode with the “must watch another” cliffhanger reveals or questions that pushed the Maxwell case along and keeps us tuned in to Dateline through a commercial break. Taylor Dearden, who you may remember from MTV’s extremely good one season wonder Sweet/Vicious, is great, as are DeRon Horton, Miles J. Harvey, Elisha Henig (which is quite a sight if you’re watching The Sinner), and Sarah Burns, whose Ms. Montgomery is an eccentric delight. Season 2 relies heavily on new technology and the internet and social media age to set the backdrop for its overall plot, but you won’t feel lost even if you have no idea what Instagram is. The larger argument as to why we all live a separate life behind a glass screen is discussed and analyzed, and you’ll find yourself wondering just how naive or reckless you’ve been in your own life. It finds its mark, it hits home, and it will leave you silent, and perhaps also lost in contemplation. The brilliance of American Vandal is in taking something ridiculous, gross (the crimes themselves are a little difficult to watch), over-the-top, and seemingly ridiculous, and turning it into a deep character study that tackles issues of the modern age that effect and affect every one of us. As much as I loved it last year, I love it even more now. It’s one of my favorite viewing experiences of the year, just as it was in 2018. You might wish it were funnier, despite its overt irreverence, but that’s only if you want it to be something it’s not. I don’t want to say much more about it, because I fear I might spoil something. It’s a work of art. You’ll laugh, you’ll think, you’ll have your own theories, and you’ll leave the fictional world of St. Bernardine, but the setting and the events will remain in your mind. Because there’s so much truth surrounding it. American Vandal has done it again. It’s such a special show. I’m @JMartZone. It’s yogurt, of course I like it.